The Data Digester Basic Edition (BE) is the smallest and cost-effective solution for all users searching for a single tool to examine message digests (aka checksums) and to verify OpenPGP signatures. The Basic Edition provides support for the commonly used message digest algorithms like MD5 and SHA as well as for OpenPGP signatures. The integrated file system window allows for an easy and intuitive working with files and directories. Simply locate the archived or downloaded files on your PC, then double-click the message digest or OpenPGP signature file and the Data Digester starts working. After an instant, you are informed whether the referenced target files have been checked/verified successfully or if they were corrupted or manipulated and should not be used any further for security reasons. Examine checksums like MD5 or SHA. Verify OpenPGP signatures. Supports GNU, BSD, and the new Digester XML file format. Check files with multiple checksums. Ideal solution to verify downloads from the Internet and check integrity of archived files. All editions of the Data Digester software provide various methods to examine checksums and signature files against examinee files. Besides the intuitive way to select files and directories within the integrated file system window, a special file selection dialog exists where you can specify either digest/signature files or examinee files. The Data Digester software automatically detects available digests/signatures and examinees. Currently, the Data Digester supports the following message digest algorithms: MD2, MD4, MD5, RIPEMD-128, RIPEMD-160, RIPEMD-256, RIPEMD-320, SHA-1, SHA-224, SHA-256, SHA-384, SHA-512, Tiger, and Whirlpool. The check docking window is the central component to setup the file checking process. Here you can configure the available options used for file analysis and digest/signature calculation. Additionally, this is the place where you can search directories and subdirectories for files so that checksum files in entire directory trees can be processed (e.g. useful for backups). The Data Digester software also handles checksum files or examinee files passed as command line parameters. For some operating systems like Windows it is possible that the installer registers the Data Digester software to process files with typical file extensions. For example you can double-click a *.sha file within the Windows© Explorer application which then opens the Data Digester software. 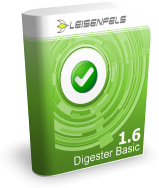 The Data Digester Basic Edition provides a convenient mechanism to download and check files from the Internet. You simply have to enter the network address of the download file or the associated digests/signature file in the so-called Quick Check field. Instead of typing the address it may also be inserted via copy & paste using your Internet browsers' address field. In the example shown below a large Linux ISO image file has been specified. By clicking the Go button the Data Digester software searches for usable checksums on the server and offers them for checking. The ISO file may then be downloaded to a local directory of your choice. If message digest files have been found and selected, the downloaded file is automatically checked against the checksums while the file is being downloaded. Once the download is complete the checking results are presented. This is an easy way to ensure that downloaded files are valid. With OpenPGP signatures it is also possible to check if the downloads really come from where they claim to originate. The Data Digester Basic edition is the ideal solution to check the integrity of large file collections like server backups or multimedia document archives. While single files may be checked with checksums and signatures, the Data Digester software allows one to check directories and whole file system trees in one single step. If any files were corrupted or somehow manipulated, this will be detected during the checking phase. The invalid data could then be replaced e.g. by a second valid backup or redundant data store. Future versions of the Data Digester software will add support for mobile devices like smart phones and tablets. So the marketing slogan "Write once, run everywhere" becomes reality. Use the command line interface of the Data Digester Basic Edition called digestercli to examine checksum and OpenPGP signature files on those computer systems lacking a graphical user interface (e.g. from a remote system). The Data Digester software implements the Apache Ant task interface to support Ant build scripting natively. Let the Data Digester GUI generate the command line arguments and Ant task definitions for you, so there is no need for additional programming.